Gamma Cassiopeiae contributes in two different ways to the nebula's creepy color palate. 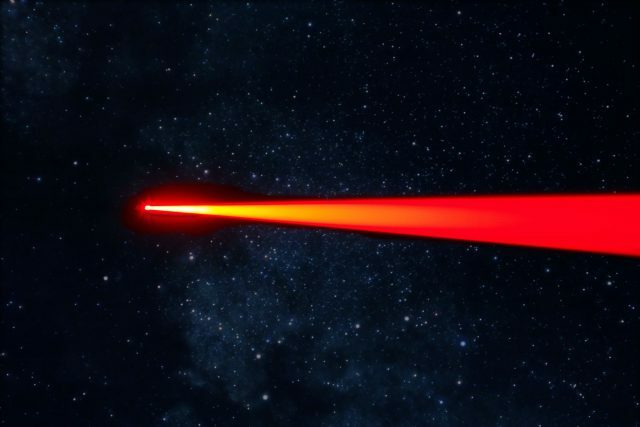 First, ultraviolet radiation from the star makes its way to the nebula, energizing its hydrogen molecules and prompting them to release a deep-red glow of hydrogen-alpha light. 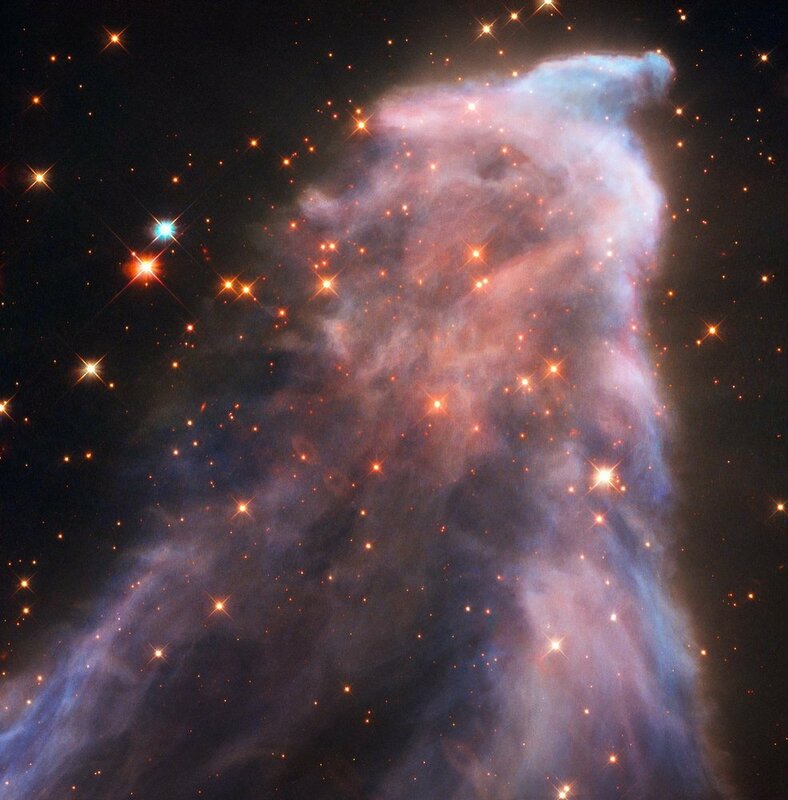 And second, light from the star reflects off the nebula's dust, glowing a cool blue. Starry night.🌟4,000 light years from Earth, Lagoon Nebula is swirling with clouds of gas & dust in a pattern reminiscent of Van Gogh. This optical image has been combined with @chandraxray data to reveal the infant stars budding in the surreal nightscape. Using a telescope mounted to an airplane, astronomers have uncovered a structure in the Orion Nebula that may shed light on one of the nebula's long-standing secrets. By combining tens of hours of spectroscopic observations, astronomers have uncovered a feature in the Orion Nebula that they've dubbed "Orion's Dragon." While flying more than seven miles above the surface of our planet, NASA's Stratospheric Observatory for Infrared Astronomy (SOFIA) recently fixated on Earth's nearest star-forming region: the Orion Nebula. Based on the data collected by the jetliner, which is equipped with a 106-inch (2.7-meter) diameter telescope, researchers determined that strong stellar winds from a particularly young and active star are disrupting gas within the Orion Nebula, which is located some 1,300 light-years from Earth. These strong winds, in turn, are stifling star formation in the region. To make their new finding, the team used the SOFIA data to create a stunning 3D view of the chaotic environment inside the nebula, a decision that also helped them uncover a newfound feature they've since dubbed "Orion's Dragon." In total, SOFIA spent about 40 hours collecting spectroscopic observations of the Orion Nebula with a recently upgraded instrument called the German Receiver for Astronomy at Terahertz Frequencies, also known as GREAT. 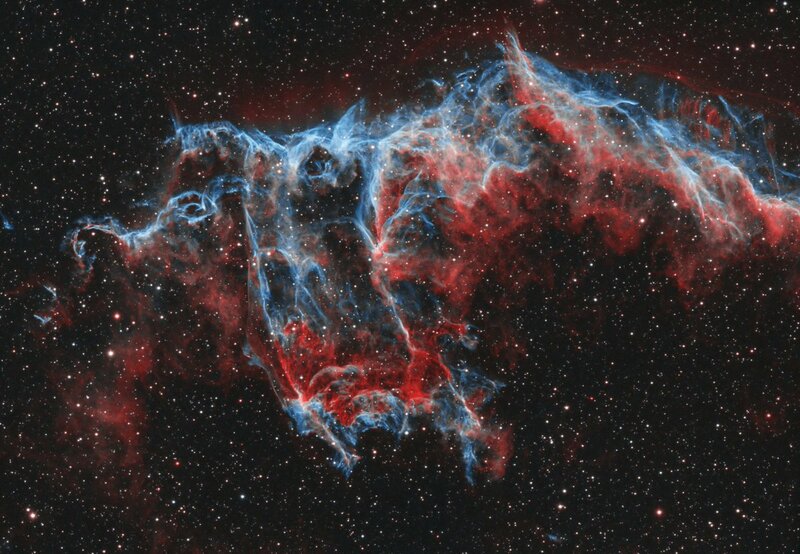 By collecting and combining millions of individual spectra, which measure the chemical fingerprints of light, the researchers were able to generate a three-dimensional data cube that contained both velocity and spatial information for gas within the nebula. "As we rotated the data cube, we got our first glimpse of the structure that we've nicknamed Orion's Dragon," said Rhys Taylor, a scientist at the Astronomical Institute of the Czech Academy of Sciences and a consultant to the SOFIA team, in a press release. "A few people have said it looks like a sea horse or a pterodactyl, but it looks like a dragon to me." No matter what critter or creature you see in Orion's Dragon, it's fascinating to know that the new SOFIA data reveals many tantalizing clues about the structure and evolution of the entire nebula. 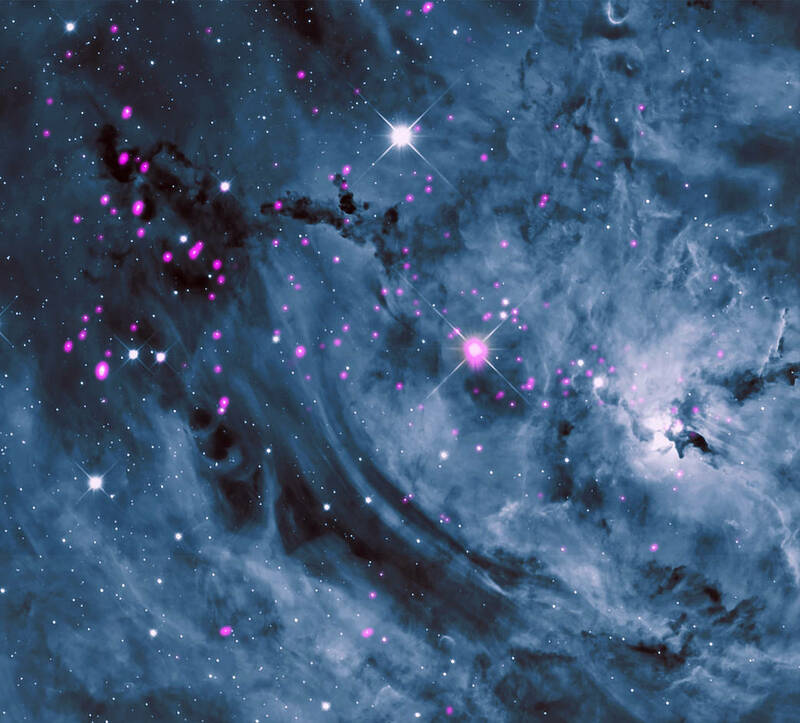 For instance, until recently, researchers thought that supernovae explosions were one of the main sculptors of star-forming clouds like Orion's Nebula; however, Orion's Dragon begs to differ. By rotating and diving through the new data cube, researchers were able to gain insight into how the expanding bubble at the heart of the Orion Nebula is shaped by intense stellar winds. Near the center of the bubble sits a particularly strong newborn star (Theta1 Orionis C [θ1 Ori C]), and the team says it pumps out so much energy that it stirs and heats up the surrounding gas, disrupting and preventing the birth of any new stars nearby. Though there is still much work to do before researchers can confidently confirm that strong stellar winds are the primary suppressor of star formation, the newly discovered dragon does hint that we may be on the path to enlightenment. 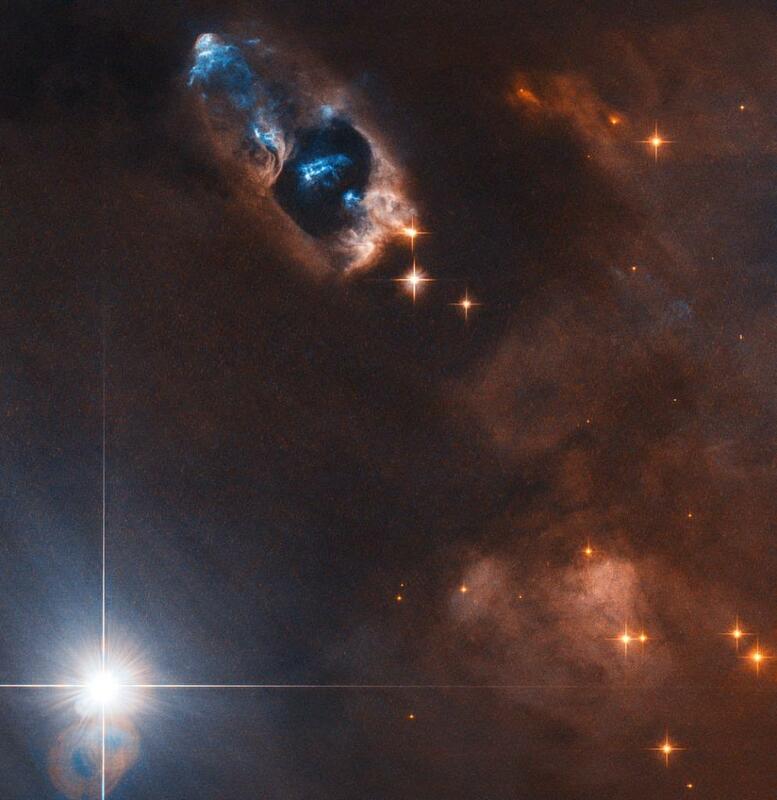 In this image, the NASA/ESA Hubble Space Telescope has captured the smoking gun of a newborn star, the Herbig–Haro objects numbered 7 to 11 (HH 7–11). These five objects, visible in blue in the top center of the image, lie within NGC 1333, a reflection nebula full of gas and dust found about a thousand light-years away from Earth.